I have blogged before about some of the problems with the teaching of writing and recent conversations on Twitter have brought this to the fore. Put simply, most kids hate writing, and the problem is only getting worse. For some time, I have been mulling this over. I get all of the arguments about making the implicit explicit, about the importance of grammar to understanding the way language works and I get, too, the problems technology creates when it comes to the mechanics of holding a pen and sustaining concentration. But none of this tackles the main issue. If we want to get pupils writing, if we want to get them becoming real writers and if we want them to pursue writing – not just absorb what we ram down their throats – then a different approach is required, based on engagement and enjoyment. It’s the oldest trick in the book when it comes to teaching: get pupils engaged. All of which is easier said than done. One of the problems facing any teacher, flitting between a zillion and one different roles, is that of imagination failure, which for me only seems to get worse as I get older. 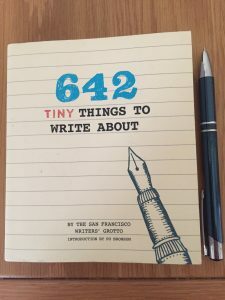 So thank goodness that I stumbled on a little gem from the San Francisco Writers’ Grotto at the The Book House in Thame, 642 Tiny Things to Write About. It’s been a godsend to my lovely Year 8 class: fun ways of starting writing, sometimes ridiculous, sometimes challenging and always engaging. I even enjoyed writing a good number of these starters myself. Many just get students thinking about everyday life and the way it might generate ideas for writing. Three ways you and your siblings are totally the same. Three ways you and your siblings are totally different. Before the judge passes sentence, what do you want to tell the court? A post card from eleven years ago arrives. What does it say? The best thing is the sheer range of tasks. None take more than a few minutes, but all get students thinking, imagining and doing something different beyond the bog-standard Key Stage 3 tropes of ‘building suspense’, ‘creating mystery’ or ‘using a variety of sentence structures’. In fact, I found many students doing those things without a tick-box approach. Some of the tasks grew to become much longer pieces of writing. A little tweaking (the book is American) certainly helps. Much as I enjoy common classroom writing tasks such as those based on pictures, the brevity of the text based prompts here liberated students to imagine in ways I never foresaw. Of course, some took a little training: our first goes as a class were just a little interrupted by the usual fuss of ‘Can I…?’, ‘Does it have to…?’ type questions. Soon, however, students were thoroughly liberated, writing quickly, freely and often with outrageous hilarity. Listening to students’ writing soon became a pleasure. But a word of warning: some tasks are ‘unsuitable’ for school. Perhaps, then, there is a market for imaginative writing prompts for secondary schools which go beyond past paper exam tasks. Publishers out there… I’m open to offers.